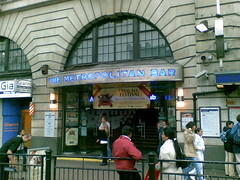 Very large Wetherspoons pub above Baker Street Station. The entrance is up several stairs, with some seating part of the way up, but most of the pub is in a large ballroom-like space, with frosted windows but hardly brightly-lit. There's an interesting interior (like many Wetherspoons), with shields on the ceiling photo (not ours). The bar stretches most of the length of the room, with three sets of handpulls. Two have regular beers (Spitfire, Greene King IPA, Abbot Ale and similar), while one set of five handpulls offers more interesting small and independent breweries. It's busy most days after-work, but the size of the place usually means there's somewhere to sit. Last visited by Ewan and work colleagues, September 2011. Opening hours taken from Wetherspoons website, June 2008. Last edited 2017-07-22 15:28:17 (version 12; diff). List all versions. Page last edited 2017-07-22 15:28:17 (version 12).